What Are the Signs I Need to Call an Emergency Plumber in Atlanta? Plumbing emergencies come in a wide range of forms. A flooded basement, a water main that won’t shut off, or a kitchen sink that refuses to drain are just a few prominent examples of emergency situations. As if the current issue wasn’t stressful enough, many homeowners worry about how much a call to an emergency plumber in Atlanta is going to cost them. With so many of us living on tight budgets, tons of people attempt to DIY their plumbing projects and end up making the problem even worse. People facing a dire plumbing emergency in their home will also stress out over how long it will take a plumber to arrive and handle the problem. There are many worrisome aspects of these emergencies! The one portion we can alleviate for you is when to make the call to an emergency plumber. Here are a few sure signs you need to call your trusted Atlanta-area emergency plumber right away. An uncontrollable water flow will result in flooding. A broken water main can flood your basement or yard. 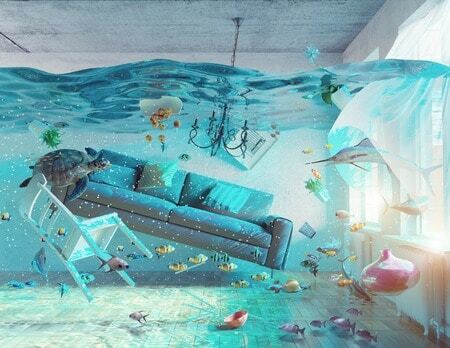 A burst pipe will flood a room or even the whole floor of your house. Flooding in the home can damage walls, studs, electrical wiring, furniture, cherished family heirlooms, and even the house’s foundation. Flooding outside can kill plants and wash away entire swaths of your landscaping and driveway. If the flooding gets out of control, it can even cause damage to your neighbors’ property. Flooding always means a call to an emergency plumber. If a plunger doesn’t do the trick to clear your sink, tub, or toilet drain, you need to call an emergency plumber. If you only have one toilet in the house, we don’t need to explain how fast the situation can become dire. It’s also hard to prepare a meal for your family without the use of your kitchen sink. A plumber will bring specialized tools to clear your pipes immediately and get your home back in business. Age and water quality are the two most important factors when it comes to the integrity of your water heater. The older your water heater is, the more likely you are to face a water heater breakdown. The harder your water, the more mineral deposits will build up and erode the water heater’s performance. At some point, the appliance will leak water or even burst. Call a plumber to replace your old water heater safely. As a bonus, new water heaters are so efficient that you will notice a dip in your utility bills right away. A little wax seal is all that separates the material flushed down your toilet from your floorboards. Over time, that wax disintegrates and loses its ability to form a tight seal. If your toilet is more than a decade old, liquid may seep through and start damaging your floors. If you have noticed changes in the floor around your toilet, call an emergency plumber before the problem gets any worse. Toilets are heavy, and working with them can be difficult. Leave toilet repairs to the professionals. Follow this rule of thumb: if you are in a panic over your current plumbing problem, then you should call an emergency plumber for help. When facing a plumbing emergency at your Atlanta-area home, call Morningside Plumbing for fast, reliable service. We strive to alleviate your stress by resolving your plumbing problems as quickly as we can. We have people answering our emergency line all nights, weekends, and holidays. Click or call Morningside Plumbing whenever crises arise at 404-873-1881 for any plumbing emergencies at your Atlanta-area home.